After much umming and arhing after finishing my Bristol Scout following a 3 1/2 year build, I chose to try this BE2e. I quite liked the look of the Be2c, but Doolittle Media/FSM do this one with a laser cut wood pack. There are a few build threads out there (David Davis has one on here) and the plane looks great in various you tube clips. 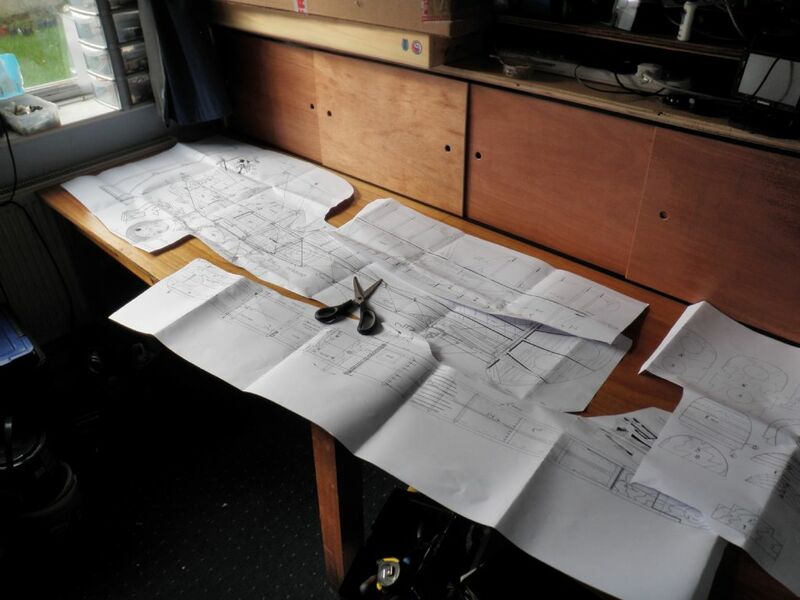 I ordered the plan and wood parts kit at the end of December, and the plans arrived a bit later them expected as Doolittle Media had needed to buy a new printer and were working through a backlog. 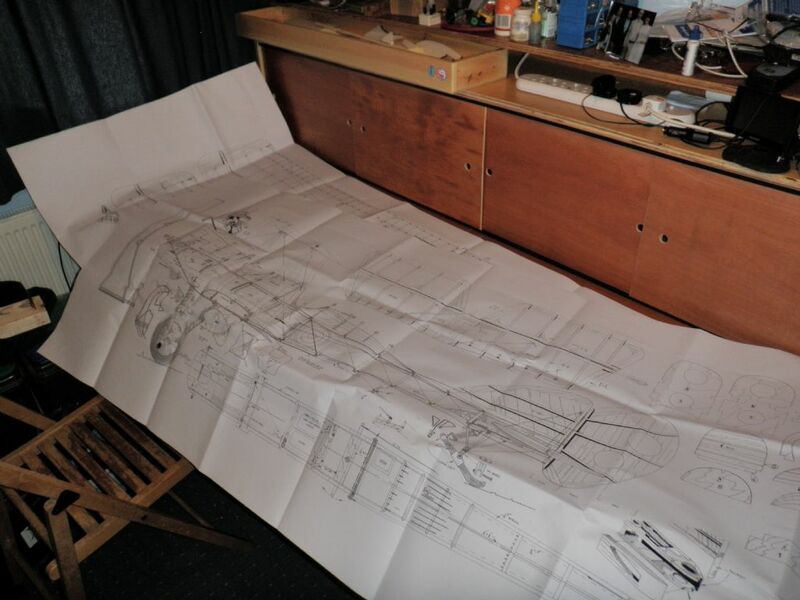 The plans initially arrived with a flaw - they were elongated as if the scanner or printer paper feed had slipped - but after a phone call new ones were sent which are perfect. I found a build article on Outerzone by the designer Roy Scott which I printed out which will help a lot. I do feel like a bit of a cheat getting the wood pack, but if I'm to get on with this and not take as long as the last build it's for the best. It will still take quite a while though - I work 48 hours a week in a timber yard and am shattered most evenings (no balsa unfortunately as the staff discount would have been useful!) and have a kitchen the wife wants replacing. Then she wants a new bathroom! The workroom is ready after fitting a new cabinet with sliding doors to hide the mess and progress will start soon - once the cowl of the Bristol Scout is mended after discovering that that biplane does indeed tip stall as a forum member had kindly pointed out but I had forgotten! 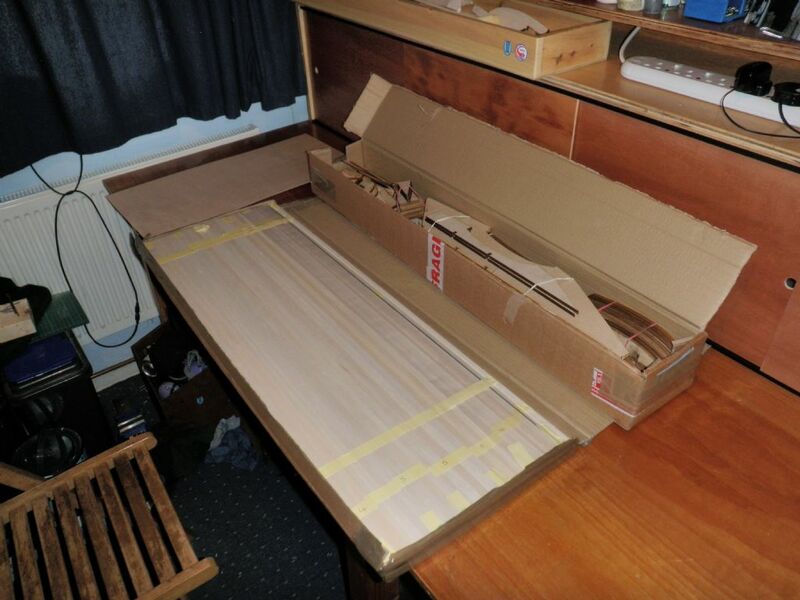 I ordered some strip wood from The Balsa Cabin and I'm ready with the glue. Is this the least enjoyable part of modelling - having to cut up the plans to manageable sized parts? Painful to chop that lovely artwork up but necessary. I always take my plans to my local print shop, he has a photocopier that will take large plans. I get to copies printed out for a few quid. Then I can cut these up as needed and keep the originals. 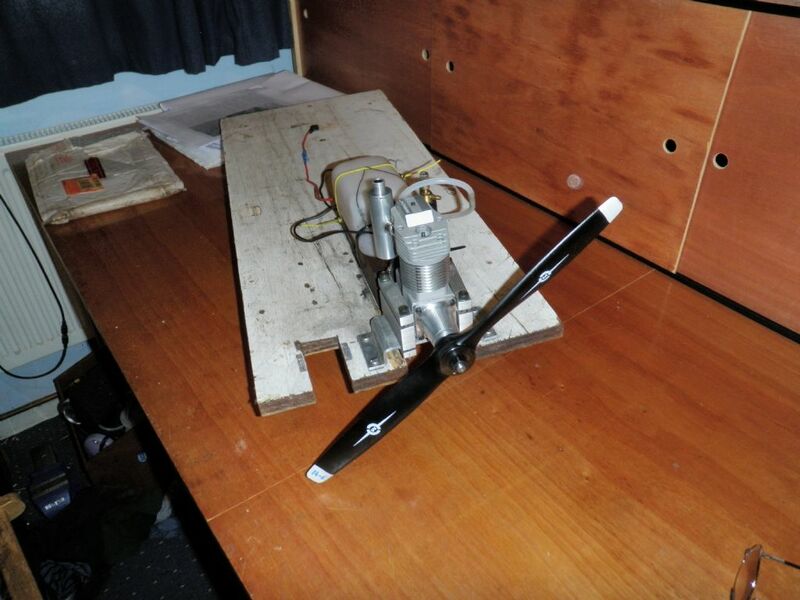 I have in the past even used the copies as templates for parts spray mounted directly onto the balsa/ply with no problems. Well I've made a start. Though I'd go with the tail wing first as it will not be affected by any changes I may make to the main wings and the fuselage. Its made in an interesting way - you do a core layer first, then a top and bottom layer so some parts end up with 3 laminations. Plenty of scope for making bits overlap each other for strength. Got started, then noticed one side looked longer than the other. Had the plan printed wrong? - no, you can see it is a drawing problem as the most left rib leading end doesn't meet the LE at the same point as the most right rib leading end! This bit must have been drawn in a hurry. The length of the left LE is 7mm shorter than the right LE, and the left elevator TE is 2.5 mm shorter than the right one! Glad I spotted this now rather than later! It'll be a simple fix, adding a bit of balsa to the left edge. It's worth checking the plans carefully isn't it? Cliff your idea of getting the plans copied first sounds good. Maybe next time! At least I do have the ability at home to copy small bits of the plan on my home computer scanner/printer when I need to. I've done a bit more - the bulk of the tail wing and elevators is done with the shaping, hinges and control horn points to sort out yet. I added a bit of wood to the leading edge and sides as the solartex would have very little to stick to there if done as per plans. Most will be sanded off anyway, but the fabric will now have a total of about 15mm now rather than about 4 around these edges. After doing the these surfaces I had a rummage in the pre-cut wood box and found some bits I had already cut myself from sheet material to make the tail plane and elevators! On to the fin and rudder. Again its a 3 layer set up, built around a 1/8" core this time. 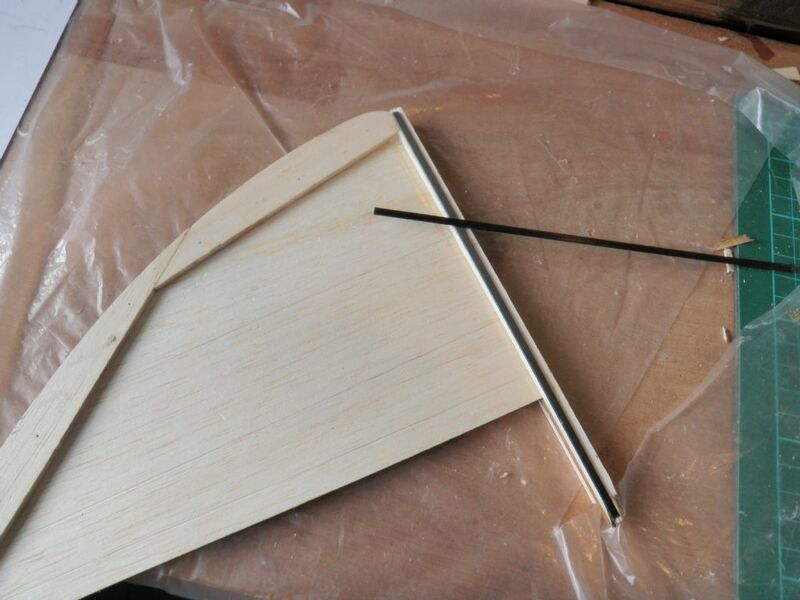 There is a stern post that connects the fin to the back of the fuselage made of balsa, but considering the possible nose overs in the long grass around our landing strip I have decided to include a bit of carbon strip on both sides within the laminar make up of this part. I'm part way through sanding down the tail plane and fin etc. 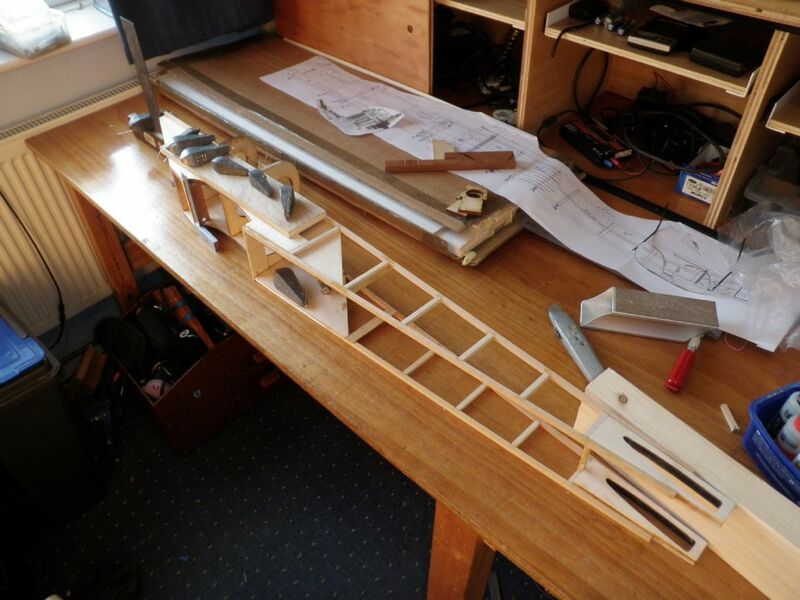 to shape, but being a little bored of that and curious as to how I'm going to proceed with the fuselage, I've decided to make a start on the preparations for that part of the build. 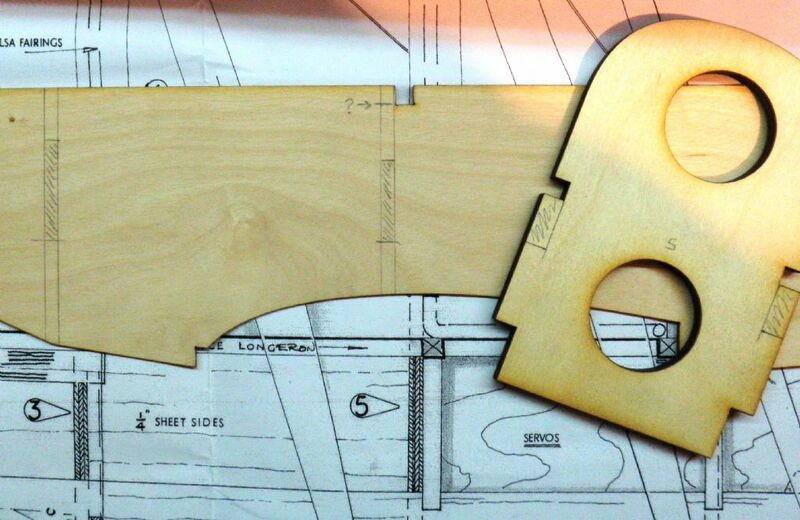 Roy's build article fuselage section starts off with cutting slots in the ply doublers for formers 3 and 5. 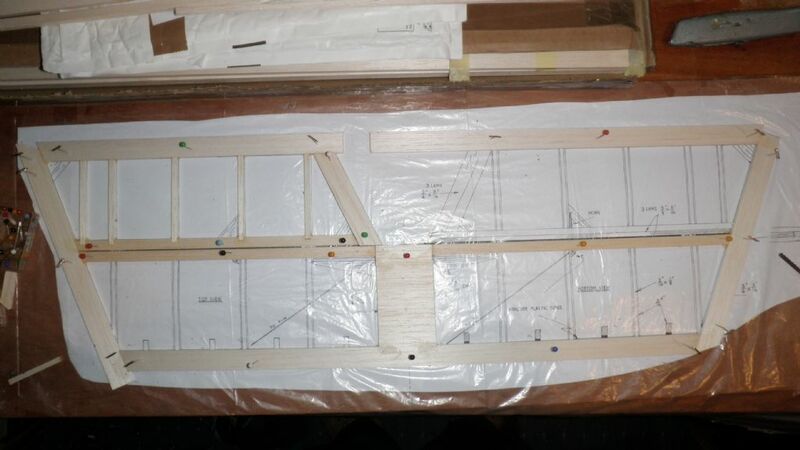 However, cutting them as per plan would have the doublers cut almost in half from top to bottom at former 5, the top coinciding with a cut out for a cross piece of 1/4" balsa - marked with a "?" on the photo. 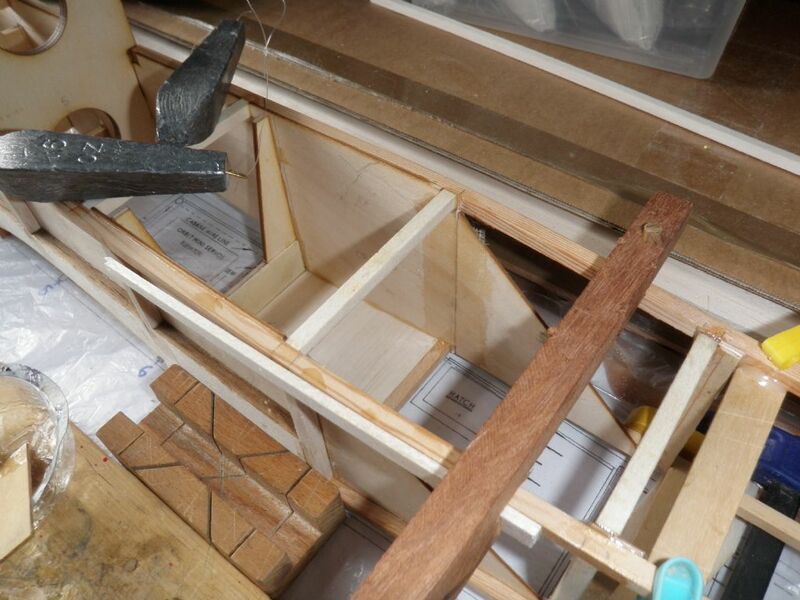 I will adjust the former and the slot to avoid this, and if at any point I want to strengthen the joint I'll put in a balsa fillet or a little bit of fibreglass and epoxy. 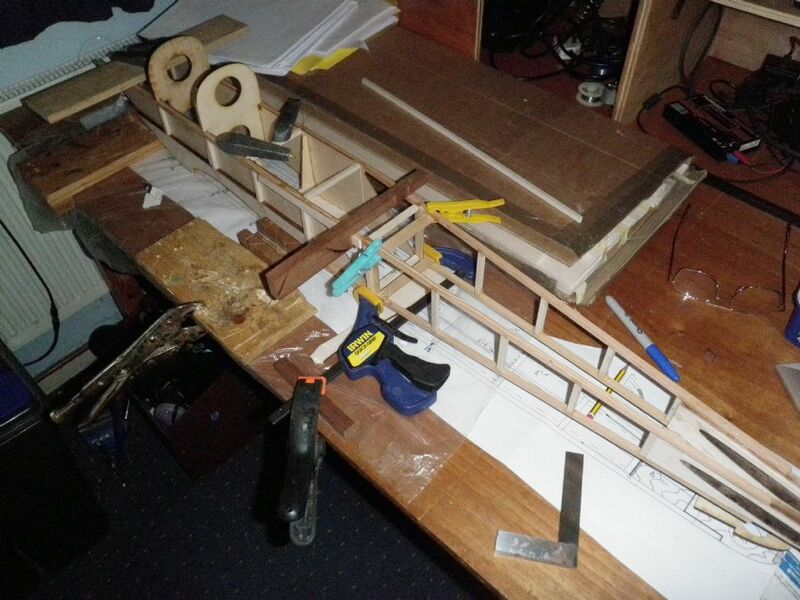 Having cut out the slots in the ply doublers for the formers, I made a start on the fuselage. The longerons are of spruce, though the plan does not specifically say the lower ones are. It is assumed that they are in the April 2010 Flying Scale Models article so that'll do me. 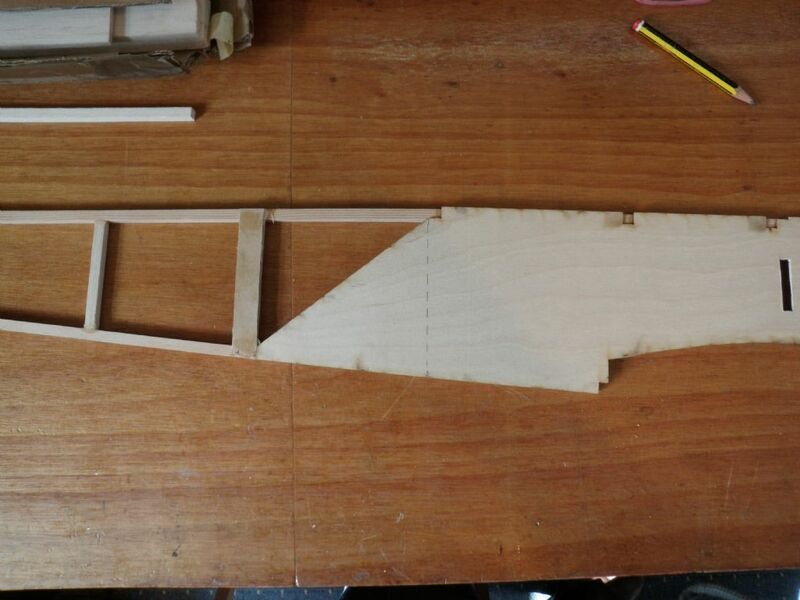 You would like to think that having built the front part of the sides, it would be an easy matter to pull the longerones together at the tail, but no so. 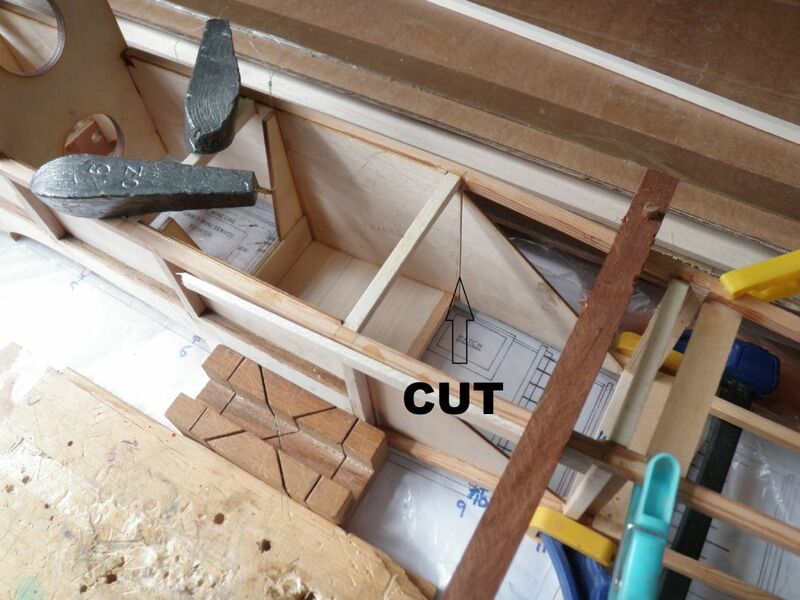 The plan calls for a tight bend in the upper one just behind the ply doubler which I supported with an extra ply brace epoxied in place to the left of the dotted line below. The top view also calls of a tight sideways bend in all the longerons at the dotted line. More of that in a mo. Anyway, the two sides came together at the front around the formers without much trouble. The fuse. was set upright next to get the sideways bend in the formers done with clamps etc whilst keeping the centre line correct above the plan along the length of the fuse.. Here is how I got the longerons bent at the right position - I cut through the ply doubler ("Don't do that it'll weaken it!" 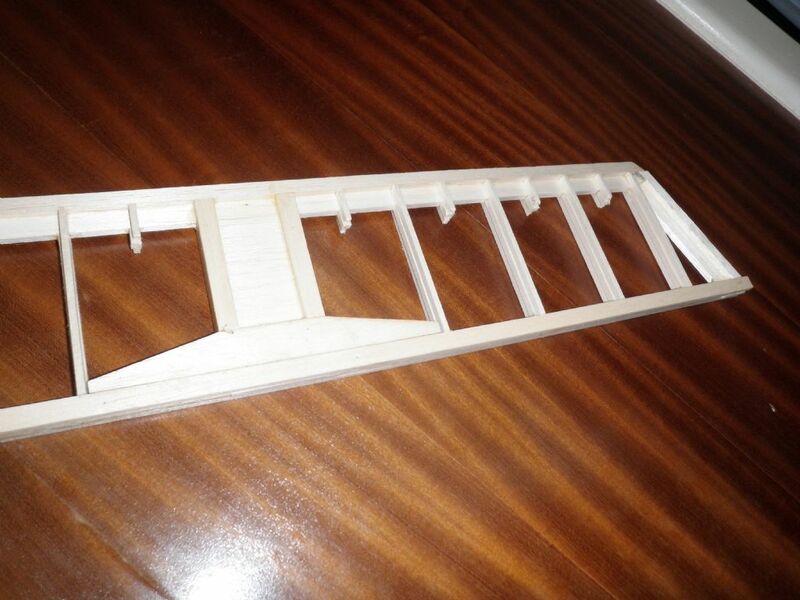 ) and applied ply braces at the relevant points with epoxy again (where the clothes pegs are). I kept these on the inside of the longerons to prevent them showing in the solartex later. I then re-strengthened the ply doubler with a fibregalss cloth strip. 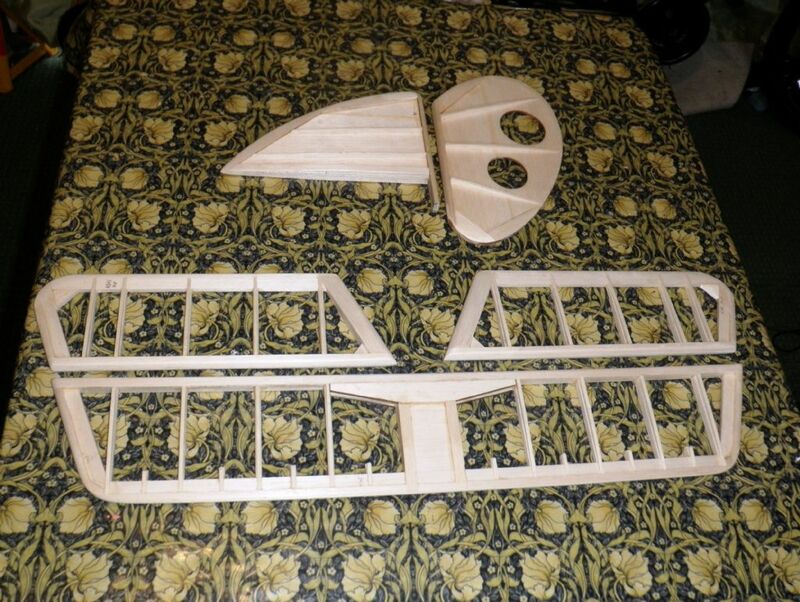 Back to the tail parts - I have at last got the main parts sanded. I may try and lighten these as they weigh 127g already. Perhaps some more holes.